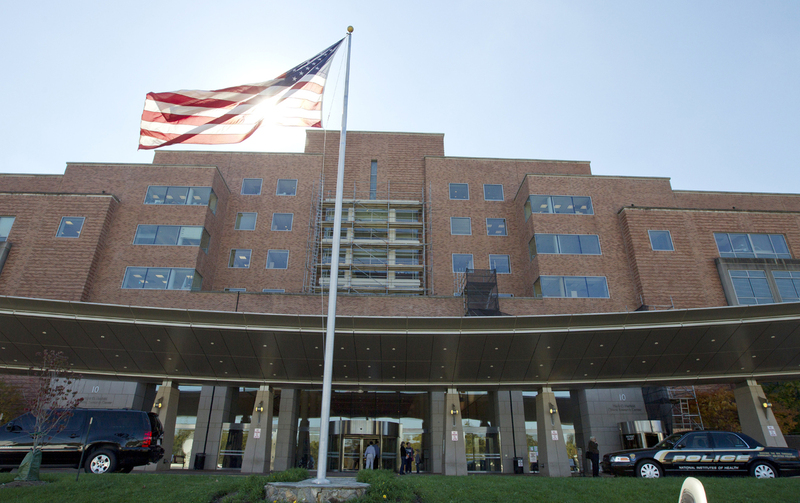 NIH Announces Leadership Shake-Up At Renowned Research Hospital : The Two-Way Following a string of safety lapses, the National Institutes of Health is making changes at its Clinical Center, the world's largest research hospital. The National Institutes of Health says it will create three new leadership positions to oversee the Clinical Center in Bethesda, Md. As NPR's Nell Greenfieldboyce has reported, the Clinical Center in Bethesda, Md., is the largest research hospital in the world. Patients come from across the country seeking its experimental therapies. But a recent independent review found safety problems at two laboratories, including one run by Dr. Steven Rosenberg, a world-renowned researcher at the National Cancer Institute. Rosenberg is a pioneer in cancer immunotherapy, which harnesses the body's own immune system to fight disease. In 2015, the NIH was forced to close the Clinical Center's in-house pharmaceutical production facility after inspectors found fungal contamination, insects in light fixtures and problems in the air-handling system. That incident prompted the formation of an independent task force to review the Clinical Center's operations. In its report issued this spring, the task force concluded that researchers were more preoccupied with their scientific studies than with the safety of the patients enrolled in the center's clinical trials. "The emphasis on research is so great, and on trying to save people's lives, that there became a cultural attitude that overshadowed handling some of the details that are important details," Norman Augustine, who chaired the task force, told Greenfieldboyce. While the safety deficiencies put patients at risk, no one is believed to have been harmed by the problems, according to the task force report. Following the report's recommendations, the NIH will create three new leadership positions to oversee the Clinical Center. One of those positions will be a new chief executive officer. "NIH will begin a nationwide search for a physician CEO with proven experience in management of a complex inpatient and outpatient facility," the agency said in a statement provided to NPR over e-mail. The new CEO will replace Clinical Center Director John Gallin, who has overseen the research hospital since 1994. The statement says Gallin will remain in his post until the new director is found. It adds: "NIH is deeply grateful to Dr. Gallin and his colleagues for their dedicated leadership, and will count on them over the next few months to move this effort forward with maximum energy and intensity."